At the beginning of the premiere of his new, six-episode Netflix series, My Next Guest Needs No Introduction With David Letterman, the once and present talk show legend enters a bare stage in his shirtsleeves and prodigious retirement beard and asks the audience if they know who his inaugural guest will be. Bringing up one audience member for a whispered prediction, Letterman jokes that, if he gets it right, the guy will be tossed out of the theater. Teasing out both his show’s title and his sustained booking power, Letterman says that the man’s faint “William Jefferson Clinton” is a good guess, before bringing out former President Barack Obama to thunderous, apparently shocked cheers. In its bare-bones structure and thoughtful approach, My Next Guest feels less like a reprise of his late-night talk show than Letterman’s self-reward for a long career, one he often spent interviewing reality show winners and other showbiz types that the notoriously prickly Midwesterner grew increasingly—and liberatingly—impatient with toward the end of his network run. The credits show that its spare musical themes are the work of longtime former bandleader and wryly glitzy sidekick Paul Shaffer, but the stage is stripped to the rigging. 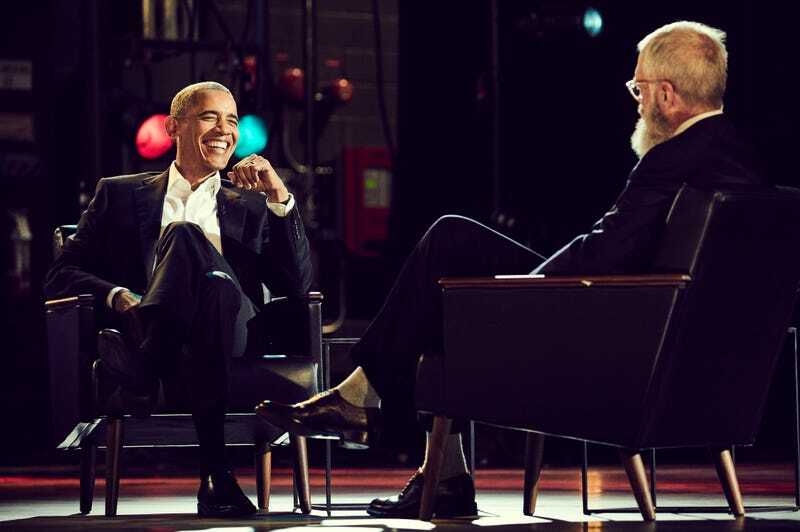 Letterman, donning a suit jacket and showing grey socks beneath his high-cuffed pants, approaches his hour-long, highly coveted sit-down with the 44th president of the United States with equal intimacy, an opportunity to talk at length to someone of genuine interest to him. It’s unassuming, and uncompromisingly anti-showbiz, with the feel of Letterman holding court at his leisure (and on Netflix’s dime). It could just as easily be titled My Next Guest And I Need No Audience. As an interviewee, Obama is as smoothly engaging as ever. In the brief filmed introduction to the episode, we see Dave on the phone, attempting to book the former president—and being politely put off. “I think it was a no,” he tells someone off-camera after hanging up, but it becomes clear as the episode goes on that, apart from the cultural cachet, there’s likely nobody else Letterman would have been satisfied with as his first guest in this new iteration of his career. Early on we see a clip from near the end of The Late Show With David Letterman’s run in 2015, where Obama and Dave joke about what they’re going to do when their respective gigs shortly come to an end. Their subsequent chat feels like the kind of in-depth hang session he longed for then. Naturally, the two talk politics, although they assiduously avoid sullying their conversation with the name of the person who’s taken Obama’s old office. (The denial takes on the form of a running joke, in Letterman’s inimitable deadpan, that serves as a more pointed rebuke than any hacky broadside.) But chiefly, My Next Guest is driven by the intellectual and personal curiosity that, one senses, Letterman has been left with an insatiable hunger for after a long life of interviewing (sometimes) fascinating people in five-minute chunks. His questions for Obama don’t come off as rote talk-show schmoozing so much as a genuine desire for context on a man he clearly admires. And they’re augmented by a filmed field segment where Letterman, spinning off from a question about Congressman John Lewis (and Donald Trump’s ignorant Twitter rant against him), meets with the civil rights hero on Selma, Alabama’s Edmund Pettus Bridge to reenact the fateful 1965 march, discussing the past, present, and future of voting rights and racial justice in America along the way. It’s an opportunity, he says, to confront his own legacy as someone who—unlike, as he claims, Lewis and Obama—didn’t see the injustices and crises of the moment as reason to put his own safety or career on the line for something bigger. There are lighter moments, certainly. Dave is still Dave, and as practiced and media-savvy as Barack Obama remains, he can still effortlessly turn a phrase (or stick the needle), and both of them land plenty of laughs. But it’s clear that My Next Guest is something different for Letterman, who has always affected an above-it-all persona—especially with regard to the very show business he was, at the same time, pursuing. Here, in this self-created semi-retirement, Letterman has carved out a space where he can still affect that same detachment. Only now he gets to dictate the terms of what he’s detaching himself from.